Jim Goldfarb, Director of Recruiting, from Atlantic Partners commented on the recognition: “Atlantic Partners has the ability to identify the best talent at market value. Our recruiters are excellent at delivering the right blend of interpersonal, analytical and technical skills which is rare in today’s staffing world. The hard work consistently sets us above the bar.” Atlantic Partners has added several new Executive Account Managers and Senior Technical Recruiters who each bring a minimum of 10 years of experience in the industry. This, combined with the 40+ years of experience of their Executive Management team, allows them to penetrate existing clients and build new relationships with new clients. Atlantic Partners continues to build its reputation based on its core principles: honesty, integrity, hard work and commitment to partnering with and providing strategic solutions to its clients. 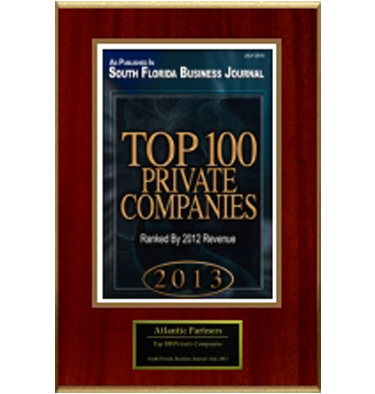 Atlantic Partners operates out of Boca Raton, Florida and New York, New York. They provide a strategic consultative approach and develop outstanding relationships with their clients to ensure that they fully understand all of their clients business, culture and values to match appropriate resources to fill staffing needs. Atlantic Partners constantly strives to improve their recruiting process and uncover passive candidates while networking with managers and current consultants to provide top-notch talent. The statements contained in this press release and attachments that are not historical facts are forward-looking statements that involve certain risks and uncertainties, including risks associated with the uncertainty of future performance of our companies, acquisitions of additional partner companies and dispositions of partner companies, additional financing requirements, the effect of economic conditions in the business sectors in which our partner companies operate, our ability to execute our business strategy and other. The Company does not assume any obligation to update any forward-looking statements or other information contained in this press release.